As the old song says, 'we're having a heatwave,'. This January, Sydney has broken records, not ones that I suppose we think much about. Since records have been kept, this January has re-written them. Days with temperatures in the low 40'sC and nights in the high 20'sC, have made us uncomfortable. I thought that I'd see how they reported heatwaves, when our ancestors were alive. 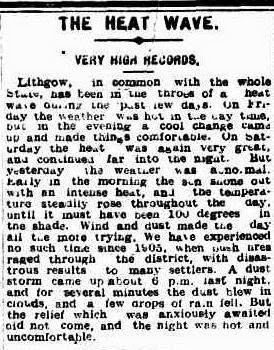 This is from the Lithgow Mercury (NSW 1888-1954) and Monday January 4 1909, p4. At least we have the benefit of air conditioners and fans to help alleviate the heat. Stay cool. Lilian. Aside from genealogy, I enjoy quilting or patchwork, as it is sometimes called. I've been seriously quilting, since 1999 and am seriously addicted! In April I'm joining friends at a quilting retreat. Two days to indulge in uninterrupted sewing, bliss! With that in mind and not wanting to start a new project, just before I go to RootsTech, I've worked on what I am going to do, at the retreat. 10 generations. I looked at mine and knew that I couldn't go back that far, so worked out how many, to 7 generations. I don't think that I have done to poorly, in tracing them. I know that some don't want to be found and some , most likely, never will be found but it is fun trying. One of my writing exercises, talks about memories that flowers can bring back to you. It asks you to find the same plant and then use your five senses, to write about your reaction to those memories. One of my earliest memories is of the large frangipani tree, beside my mum's bedroom window. Mum would often break pieces of and give them to friends and family, I think she took a few pieces when we moved but I'm not sure. Thick branches, like these, were ideal for climbing, ( told not to but did it anyway). I can remember the rough texture of them and how they would sometimes look firm but be really soft and would break, underfoot. I did fall out of the tree, once and cut the inside of my thigh, a long thin cut that required many Band-Aids. I wore that scar with pride. Stuck on what to write? Not sure where to begin? These two blogs, below are from FamilySearch and have some good ideas for getting started. (I hope the link works, if not cut and paste into your address bar.) FamilySearch blogs are interesting and cover all different topics, well worth a look. 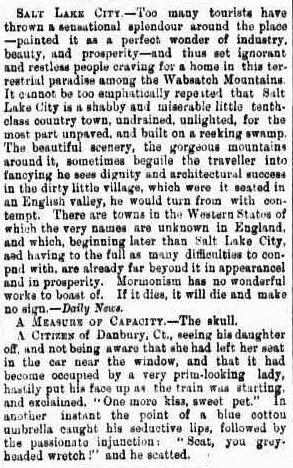 As I'm going to Salt lake City, in early February, I thought I'd see what was reported in Australian newspapers. This article is one of many I found and it doesn't paint the city in a very good light. Bacchus Marsh Express (Vic_1866-1918), Saturday 16 March 1872, p3. A far cry from the disparaging comments of 1872. The mountains are still beautiful. Mormonism does a wonderful works. Bye for now, Lilian. This post is asking for a bit of help and I know the answers to what happened to the family, as I have researched them. I was asked for help, via Facebook and it went something like this. This was followed by several messages, photos of the relevant pages. Email arrives with six photos attached. This family is very interesting and I’ve had fun researching them and now it is time to find family, who want the bible. John Graham Bissland and Caroline Jane Alder married 25th April 1860. John was born in Paiseley, Scotland, 28th August 1834. Caroline was born in Sydney, New South Wales, 21 November 1842. Writing the story of your life, is a practical book. Divided into four parts; Where have you been all this time? ; The practical matters of writing. ; You, the night, the music. ; What happens when you write? 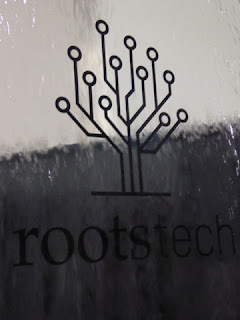 With Christmas and New Year over, my thoughts are turning towards my trip to Salt Lake City, Utah, For RootsTech. I hope that there will be snow, like last year. It was my first experience of snow and I loved it! I'm really looking forward to catching up with friends I made and also making new ones. 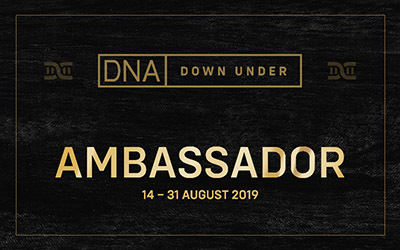 This year there will be a large Australian contingent and it will be great to catch-up with them and enjoy the Commonwealth Dinner. There are so many interesting and wonderful sessions, that picking just one for each slot it becoming very hard. Several of the ones on Scotland have caught my eye and there is a new one on Ireland as well. Decisions, decisions, decisions. I know from last year that some are just promoting a product but that others, with vague titles were fantastic! I'm also working out what I need to research. It is always good to go to any research facility with a plan and going so far, this is a must.